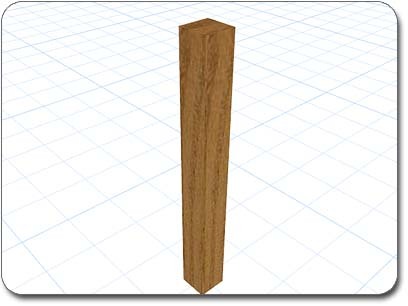 In this tutorial we will create a simple and elegant wooden patio table using the Box and Cylinder modeling tools. This tutorial will show you how simple shapes can be used to create 3D models that will compliment your landscape designs. Open your Realtime Landscaping software and begin a new landscape. 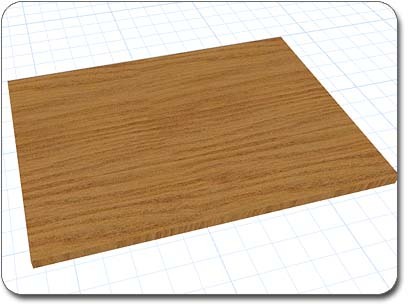 The first part of the table will also be the simplest. We will create the table top by creating a box, setting the correct dimensions for the box, elevating the box in the air, and setting a wood material. Create the box by clicking the Box button that appears when the Modeling tab is selected. Click on one part of the landscape to place one corner of the box, and then click on a different part of the landscape to place the other corner. Set the Width property to three feet and six inches (3’6”), set the Length property to five feet (5’), and set the Height property to two inches (2”). Then set the Elevation property to two feet and four inches (2’4”). Next, click the picture of the default material of the box in the upper-right corner of the screen. When the library appears, click the Deck and Fence category and select Wood112. The completed table top is shown below. Next we'll create the table legs. The legs will be boxes, just like the top. We will create one leg by making a box, setting the correct dimensions for the box, and then set the same material as the top. Once we finish one leg, we can simply copy and paste it to make the other three. Create the box by clicking the Box button. Click on one part of the landscape to place one corner of the box, and then click on a different part of the landscape to place the other corner. 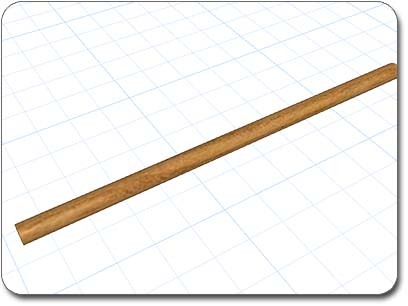 Set the Length and Width properties to three inches (3"), and set the Height property to two feet four inches (2'4"). Set the material to Wood112 as you did before. 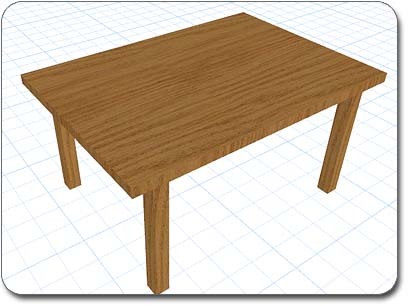 Copy and paste the table leg until you have four legs, and position them under the table. In this step we'll add add four cylindrical supports to the table legs, making our table look more sturdy and appealing. We will first create a cylinder, set the correct dimensions, and set the material as before. Once one support is finished, we can copy and paste it until we have four supports that are ready to be placed on the table. Finally, we will convert our entire table to a single model and add it to the Accessories library for use in our future landscape designs. Create a cylinder by clicking the Cylinder button. Click on one part of the landscape to place the center of the cylinder, and click again on a different part of the landscape to set the radius. Set the Height property to three feet and ten inches (3’10”), and set both Radius1 and Radius2 properties to one inch (1”). Set the Rotate about X property to ninety degrees (90) in order to make the cylinder horizontal. Set the material to Wood112 as you did before. Make sure the support cylinder is still selected, and then click the Convert to Custom Model button. This will convert the cylinder to a custom model which will make it easier to adjust its size. Copy and paste the support until you have all four supports. Now, move each support between the legs of the table where they belong. Then resize the length of the supports as needed. To do this, first uncheck theScale Evenly option, and then adjust the Scale about Z slider until the supports fit between the table legs. Finally, we can add the patio table as a permanent addition to our library. 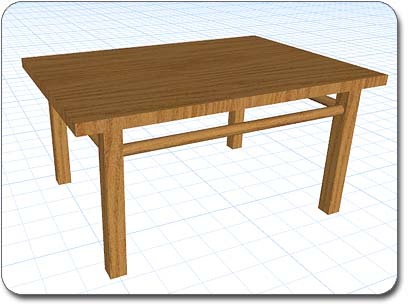 To do this, select all parts of the table and click Tools > Model Creation Wizard. Follow the prompts of the wizard, and select Accessory when asked what kind of model you are creating. Once the wizard is complete you will have completed this tutorial. Congratulations! 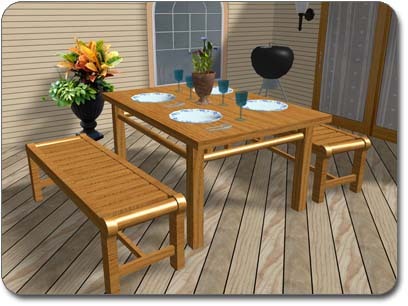 You have now created a custom 3D patio table which you can easily add to your future landscape designs.